ГЕРОЇКА Short news in English – Благодійний фонд "Героїка"
11.26.2016. A monument has been unveiled today in Kherson region, in honour of the Crimeans who died in the battle for Ukraine. The Crimean Ukrainian War Memorial has been opened on a borderline with annexed Crimea. The monument is dedicated to the natives of Crimea, who have fallen in a fighting with the Russian aggressors. The ceremony was attended by the representatives of the Ukrainian Armed Forces, families, fellow soldiers of the fallen heroes, the veterans of the Russian-Ukrainian war, government officials and the public. The monument of “Crimeans who died in the fighting for the unity of Ukraine” has been built near the Kalanchak-Armyansk road, as an initiative of Heroyika Charitable Foundation, which also covered the construction expenses. “The monument will greet the travelers, on their voyage from Kherson region to the Crimea and back. By building this monument, we wanted to show the Ukrainian in the occupied territories, that their heroes weren’t forgotten. “- says Pavlo Podobed, the director of Heroyika Charitable Foundation. The memorial plates are engraved with the names of 21 soldiers of the Ukrainian Armed Forces, policemen and members of volunteer battalions. They were killed in action, during the fighting in the Donbass region in 2014-2016 years. “Implementation of this plan was a result of combined efforts of donors, volunteers, war veterans, representatives of the Crimean Tatar community and local government officials. The construction process had united over 200 participants and benefactors. People donated money and helped at different stages of this project. This is a real people’s project, which demonstrated the attitude of the Ukrainian people towards their heroes”- says Oleg Sobchenko, a former combatant, who supervised the construction of the memorial. 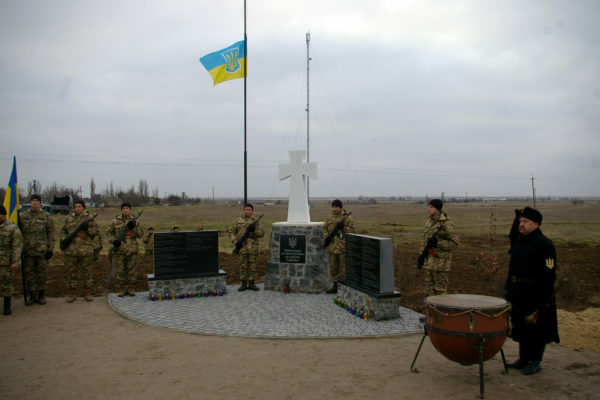 This memorial has been built at the expense of Heroyika Charitable Foundation in a southern Kherson region (near the road E-97 – Exit to village of Stavky, Kalanchak raion), 6 km from temporarily occupied Crimea. Monument is dedicated to the Crimeans, who have fallen in a fight with the Russian aggression in eastern Ukraine in 2014-2016. The grand opening will take place on November 26th, 2016 at 14:00. 11.05.2016. “Heroyika” decided to build a monument “Crimeans who died in the fighting for the unity of Ukraine”, in a southern region of Kherson. During the Russian-Ukrainian war of (2014-2016) over 3,200 Ukrainian soldiers have been killed in combat with the enemy. Among them are at least 21 natives of Crimea, who defended the independence and sovereignty of the Ukrainian state. Given the fact that the Ukrainian Crimean heroes cannot be honored in their occupied homeland – “Heroyika” decided to build a monument “Crimeans who died in the fighting for the unity of Ukraine”, in a southern region of Kherson. During 2016, we received all of the necessary permits from the Ukrainian authorities and 26 October 2016, on the E-97 road, 6 km from the Russian occupation checkpoint, our construction work has begun. As of November 5, 2016 the project is near 60% of completion. 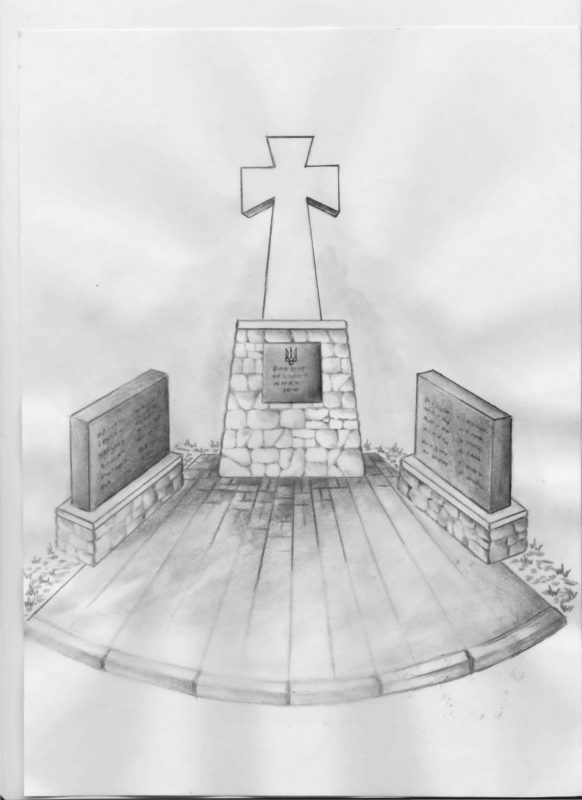 The total construction budget of the monument is $ 2,400. We have raised over $ 2000, but still require funds to finalize – landscaping, installation of flower beds, providing drainage, construction surveillance and more.